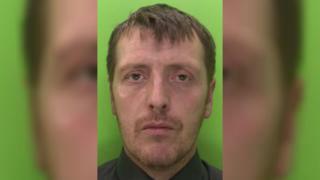 A man has been convicted of strangling his partner at their home in Nottinghamshire. Michael Foster, of St John's Place, Mansfield, was found guilty at Nottingham Crown Court of murdering 44-year-old Paula Harris. Police said 39-year-old Foster killed Miss Harris on 28 January and, on leaving the flat the next morning, told a neighbour "she's still asleep". A jury unanimously found Foster guilty. He will be sentenced on Monday.